Back in 1939, Oceana was the first State-Of-The-Art picture theatre in Europe. After the 1980s, the theatre was closed and reopened as an entertainment complex. Oceana Nightclub only made its appearance in 2003. Set in Kingston-Upon-Thames, Oceana is one of London's most unusual clubs. With a capacity of over 2000 people, Oceana hides 7 themed rooms, 5 bars, a two main dancefloors. It also holds one of UK's biggest student nights every week. The décor is not what you expect from a nightclub, but that's what Oceana is all about. Every area of Oceana has a well-defined theme. So, depending on your mood, you can switch from one area to another throughout your night. Each of the rooms has a style and offers a different atmosphere. The Venetian Ballroom is the main room with a huge dancefloor. And judging by its name, it is a really glamorous room. 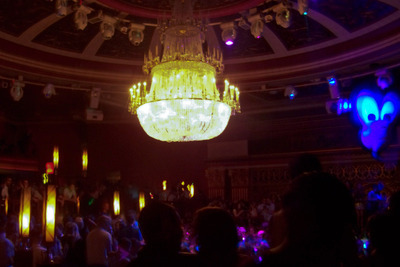 A huge chandelier overhangs the main dancefloor, with large stairwells and balconies along the edge. They kept the old theatre theme here and it really is different to any other nightclub you could go to. Sure the floors are a bit sticky here, but you will definitely be shaking your booty all night long in this main area. Wakayam Tokyo was the room I thought was the most unusual. It's a kind of futuristic Japanese bar, with televisions and a lot of neon lights. 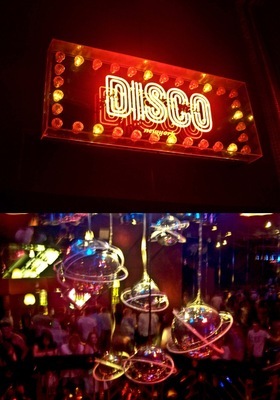 The New York Disco room is the other most popular room after the Venetian Ballroom. It's a really cheesy disco area with lots of mirrors and lots of coloured glass panels. This room plays all the old party tunes and has that kind of Saturday Night Fever atmosphere. The Parisian Boudoir is one of my favourite rooms, but there is no dancefloor. It's a more chilled area, with red walls, velvet drapes and nice bed seating areas. Very Moulin Rouge style, I just love it. I reckon it would be a great room to book for a birthday. However, an area that really made me think was the Aspen Ski Lodge room. I couldn't stop wondering why someone would include this kind of theme in a nightclub. In the middle of Oceana, you can find a ski lodge. Yes, I said it, a ski lodge. With a fireplace, logs and warm couches as if you were in the middle of Alaska or something. I know London is freezing but that is kind of weird in a nightclub. The other rooms are the Belvedere Suite , Hofburg Suite, the Departure Lounge and the Old Oceana. These are more relaxed and comfortable, maybe more suitable for corporate celebrations. It varies in each area but there is always something for someone to enjoy. DJs are on every Monday to Saturday playing commercial, dance, disco, drum & bass, house, pop and R&B. Oceana has hosted some of the biggest Djs in the music industry. Just recently, Calvin Harris was there and Pendulum is set to come soon. There are five different bars in Oceana and all offer beers, pre-mixed drinks and basic spirits. Some nights, you can have a £2 drink deal on certain beverages, which some people take advantage (when they shouldn't). Now that 'summer' is back in the UK, summer cocktails have made their way to Oceana, with the usual mojito, strawberry daiquiri and more new cocktails to discover. Oceana is usually busy on Friday and Saturday nights. The queue is also pretty long, so you better get there early or be on the guest list. The entry price depends on the day and time you go. There is a concession for students upon a valid student card and Monday and Wednesdays are student nights. The dress up code is pretty strict; don't even try getting in with trainers or thongs. Inside, it's grooving. Since its opening, Oceana is the kind of place where you have to leave your dignity at the door and let loose and have fun with your friends. Drinking and dancing goes on in abundance, so its definitely not the place for the weak. Oceana sure has the weirdest rooms and the floors are sticky, but I guarantee you will leave there exhausted, having had a great night on the dancefloors.